There are some maps on these articles that were produced using ggplot2 excellent package in R. We want to share our code here. First, let’s get a world map. We’ll use the getMap function from the rworldmap package. I prefer this function to the map one, because it gives more accurate and more up to date borders. I used the same method when I explained how to draw the European Union map. 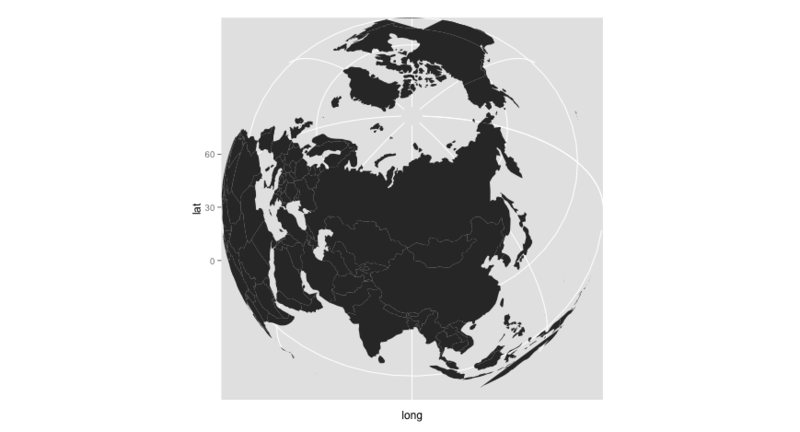 There is an awesome function that enables us to change the projection for the map in a split second: coord_map, still in ggplot package. Playing with the orientation is easy too. 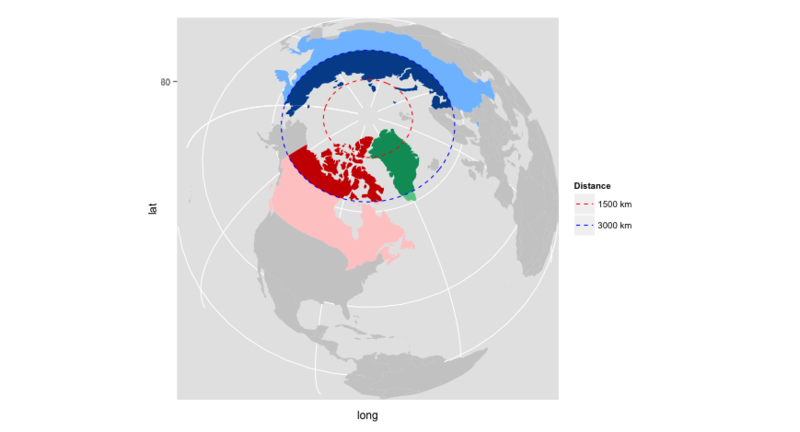 Now, we wanted to highlight regions in Canada, Russia and Greenland lying 3000km or less away from the North Pole. This seems a pretty mere task, but it gets kind of arduous when dealing with multiple polygons representing a single country. We need a function that gives the coordinates of points on a circle given a radius and an origin. 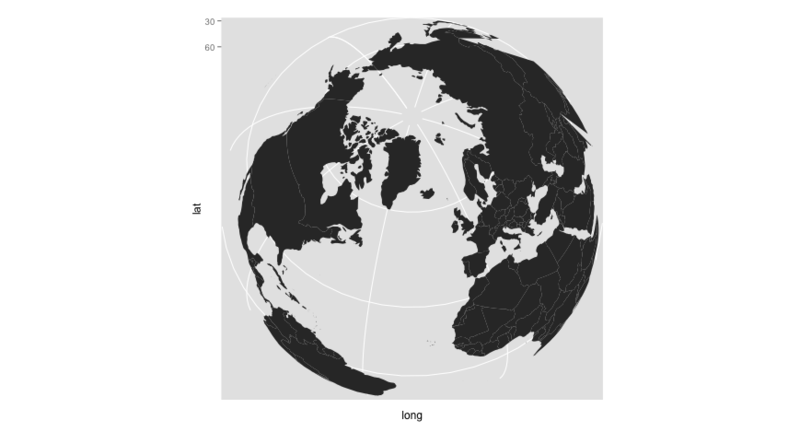 The tricky thing here, is that the North Pole latitude is (90^circ), but there is an infinity of coordinates for the longitude, and using the destPoint function from the geosphere package does not work when providing the couple ((0,90)). 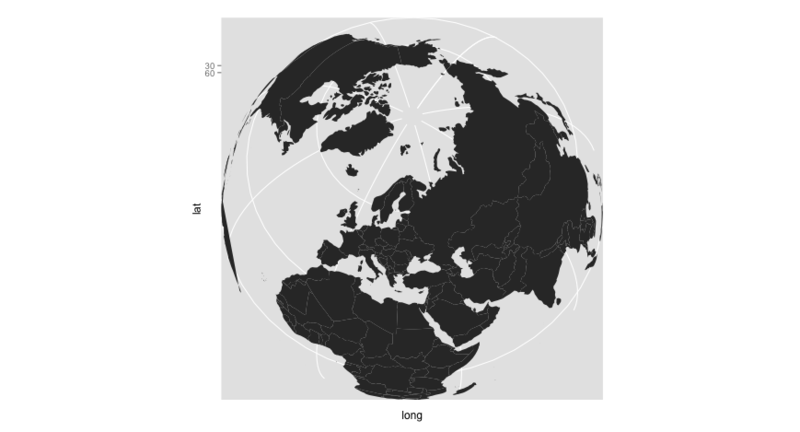 To get around this issue, I cheated a bit, by adding a really small value to the longitude and latitude of the couple ((0,90)). # returns the coordinates of 360 points on the circle of center x and radius radius km. We can apply these functions for Canada, Russia and Greenland. I want the circles to be drawn last so they are not hidden by the polygons. So, I make sure their name in the data.frame begin with a “z”. I think there is a more efficient and beautiful way to accomplish this, but I am not aware of it. If you are, please share your method with me in the comment section below. And finally, we can print the map! Now, let’s see how to work with gridded data. To illustrate the method, we are going to use some NASA data : GISS Surface Temperature Analysis. There is a link to a txt file for gridded data at the bottom of the page. First, we need to load the file in the R session. Before plotting the map, let’s analyze this code. 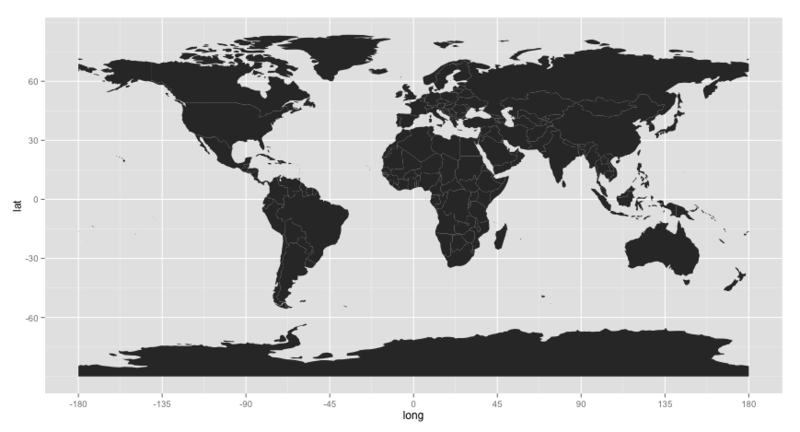 We want to plot tiles, so we use the geom_tile() function (that makes sense). Data come from temp, where we can find the x and y coordinates. 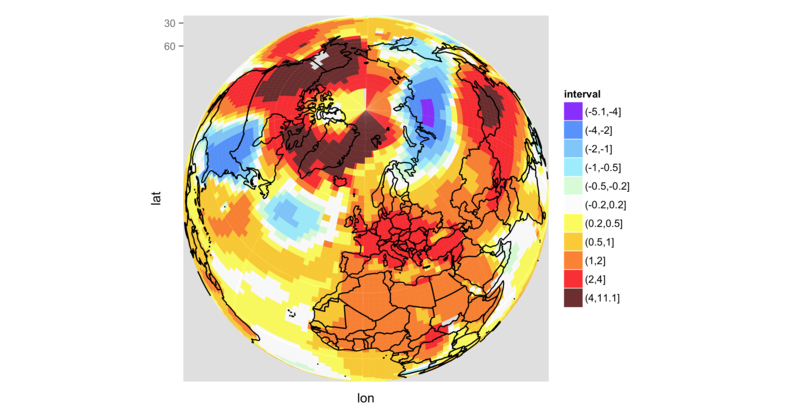 Since we want the tiles to be filled with a colour corresponding to the surface temperature anomaly, we make sure to use the fill argument. And finally, in order to get the same colours as those on the NASA map, we have to change them manually, using the function scale_fill_manual. The result is a huge file (~28 Mb) which can be seen here (I left the legend title in French). alors la chapeau Ewen, c’est spendide. Tu ne te serais pas faciliter la vie si tu avais utiliser gganimate de D.Robinson pour le GIF? Merci Aurélien. Il faut que je mette le nez dans ce package, merci (il n’était pas encore sorti lors de la conception de ces GIFs). Hi, Ewen! Thank you for your nice article and codes. I like this! 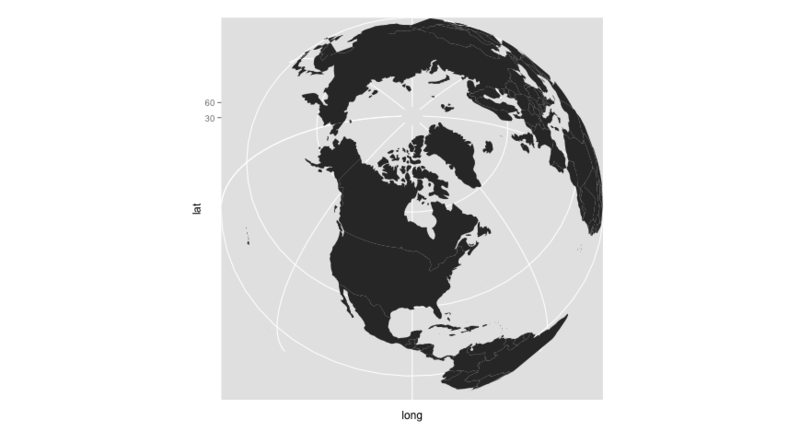 But I have one question about the coordinate for the latitude under the “ortho” map projection. In the map, I found it confused to interpret the latitude numbers on the y axis because it seems not easy to find a corresponding line to each number especially when the figure turns to an animated one (we can see the numbers on the y axis also move). Could you give more hints about that? Thanks! Hi Mengjie, I agree with you. It might be a better idea to hide these coordinates, right?